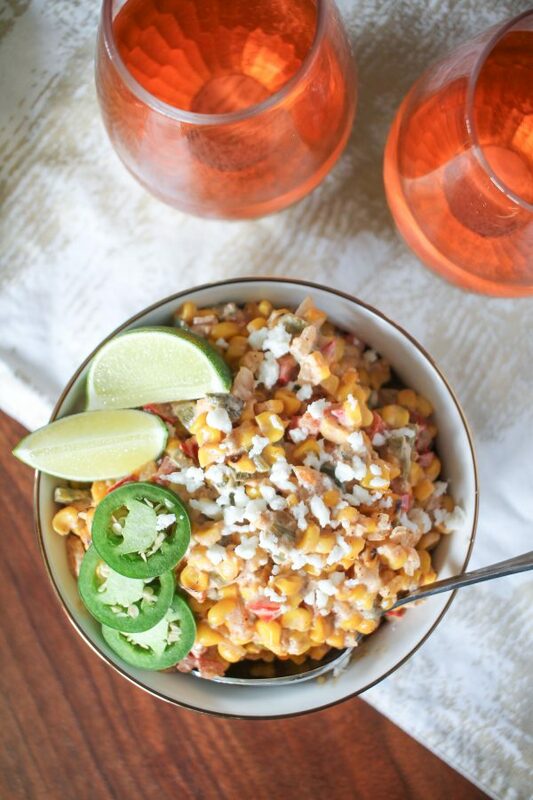 This Elote Casserole is a spin on my favorite Mexican street food. Elotes combine the fresh flavor of corn on the cob with creamy cheese, zesty lime, and a touch of spice. I love elotes so much that I might be guilty of ordering only elotes when I am walking by one of my favorite Mexican joints. 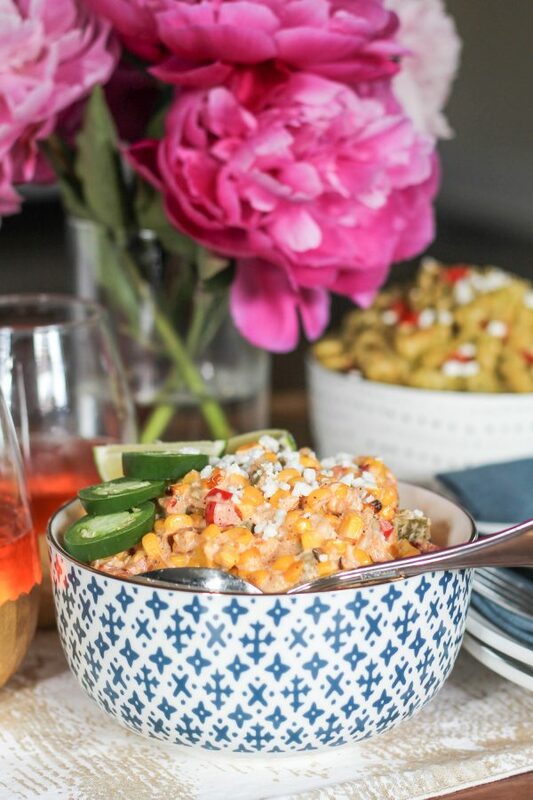 Elote Casserole takes all of the basic ingredients in elotes and turns it into a side dish perfect to serve at a summer barbecue. Elotes are traditionally served on the cob, but I think that makes it harder to make a big batch. 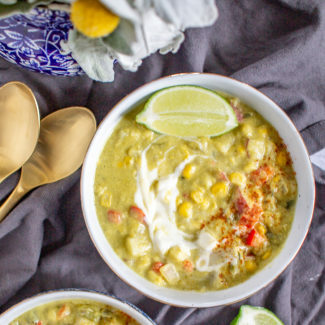 Elote casserole is made with corn that is cut off the cob, so it is easy to make enough to feed a crowd. 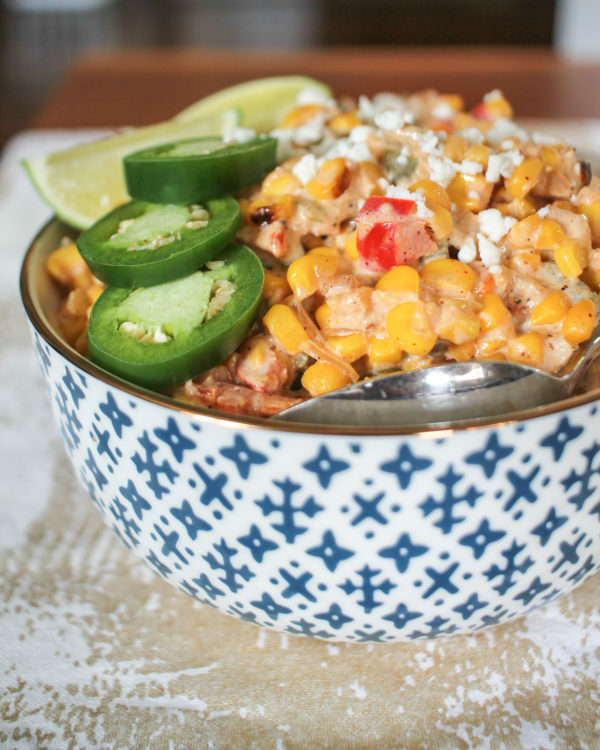 In addition to the corn, cheese, lime, and spice in elotes, I added some roasted poblano pepper, red bell pepper, jalapeno, and red onion to this elote casserole. The poblano and jalapeno peppers add a mild heat to the side dish. 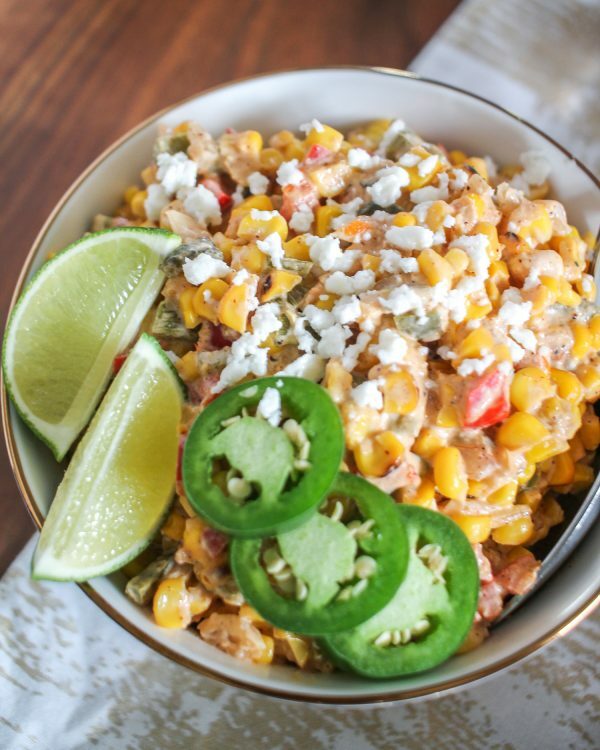 If you want your elote casserole to be spicier you can add more of the jalapeno, or more of the ancho chili and cayenne pepper. I grilled the corn, but you could opt to steam or boil it instead. You could even use frozen corn (just cook it in the microwave). 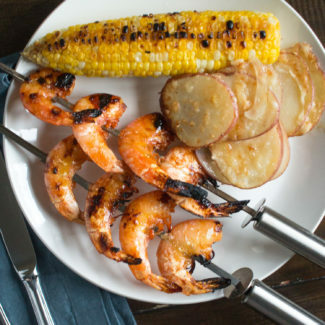 I had never grilled corn before, but it couldn’t be any easier. Just place the corn, still in the husks, on a hot grill and let it cook for 25 minutes. Let the corn cool for about 5 minutes and then remove the corn from the husk. If you want some grill marks on the corn you can briefly place the corn directly on the grill. 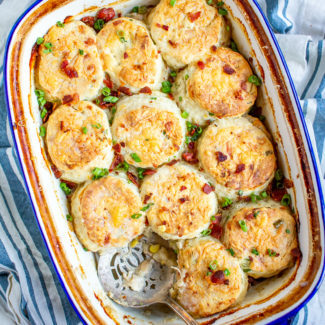 Once the corn has been grilled and cut off the cob this casserole comes together in just minutes. It is made on the stovetop and doesn’t need to be baked, so the total preparation time for this dish is just about 40 minutes from start to finish. First, grill the corn. I leave it right in the husks and place it on a hot grill (400 degrees will do the trick). Grill the corn for 20 minutes, rotating it every 5 minutes. Let the corn cool. 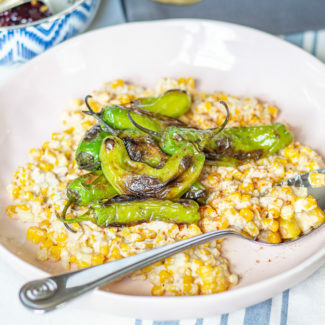 While the corn is cooling, roast the poblano pepper. Place the pepper over a gas burner and char the skin of the pepper. Remove the pepper from the burner, slice the pepper into large pieces and peel off the charred skin. Then finely chop. Once the corn has cooled, slice the ends off the corn husks, and squeeze the top of the husk pushing the corn out of the husks. This technique works really well and makes sure there are no silks left on the corn. Then slice the corn off the cob. Melt the butter in a skillet over medium heat. Add the red onion, and saute for 2 minutes. Then add the chopped jalapeno and red bell pepper. Cook for another 3 minutes. Add the cream cheese, queso fresco, flour, milk, ancho chile powder, and cayenne pepper powder. Stir to combine. Once the cheese has melted add the corn, poblano pepper, and lime juice. Stir to combine. Simmer for 3 minutes to heat up the corn, and then serve. 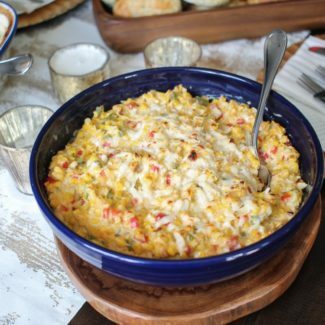 If you want to try another corn recipe, try this recipe for Thanksgiving Corn Casserole, it’s really rich and creamy. 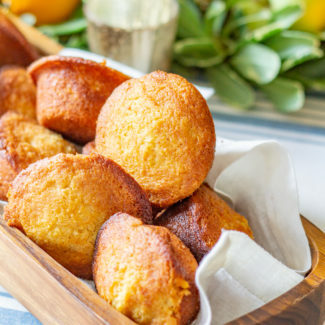 It definitely isn’t easy on the calories, but it is one of the most popular recipes on this website.